I am honored to have 3 paintings accepted for Lyme Art Association’s “A Show in Four Acts”. 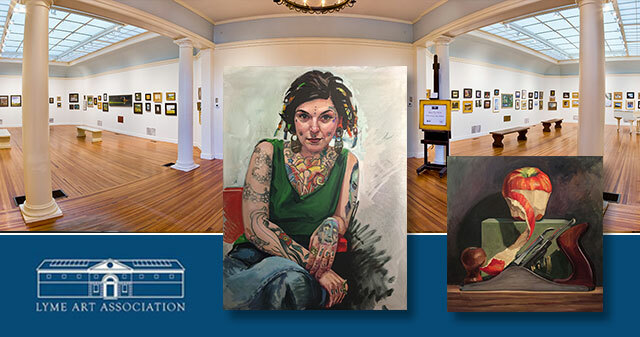 Four new exhibitions, each with a different theme, on view Friday, March 9 – Friday, April 2o in LAA’s beautiful historic galleries. Opening Reception Sunday, March 18, from 2pm – 4pm. My paintings Cheryl 30″ x 40″ oil on canvas and Emma 30″ x 40″ oil on canvas have been accepted for the “Faces and Forms” exhibit and Apple Peel 30″ x 30″ as part of the “Life on Hold” exhibit. I am extremely honored to have Cheryl awarded Juror’s Choice for the “Faces & Forms” exhibition by jurist Peter Zallinger. And doubly honored to have Apple Peel also awarded Juror’s Choice for the “Life on Hold” exhibition by jurist Robert Zappalorti. I’m very grateful to the jurists for selecting my work and especially for the opportunity to display my paintings alongside such a wonderful group of artists in the beautiful LAA galleries!